On Second Scoop: Ice Cream Reviews: Spring is in the air! Time for new 2010 products!! Spring is in the air! Time for new 2010 products!! The Shaws by my work had themselves quite a busy weekend, I can't believe how many new products I saw!! Good thing I had my camera phone (though please excuse my picture taking, I was trying to be somewhat discrete as I took multiple pictures). Not to be overly addicted to ice cream, but I think I'm just a smidge immensely giddy with the thought of new products to test. 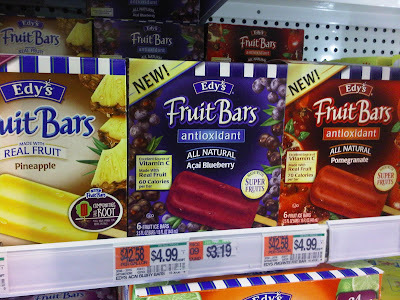 I saw these first at the end of the aisle, 3 new Fruit Bars from Edy's: Pineapple Fruit Bars, and then two antioxidant flavors, Pomegranate and Acai Blueberry. Those flavors sounded familiar, and then I remembered why. $4.99 gets you six bars. The best part here is the Communities Take Root program which will donate fruit orchards to 25 deserving communities this summer. 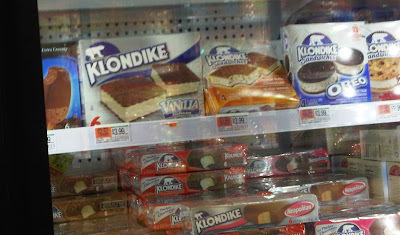 Ahhh, looks like the Klondike brand has taken over the Oreo and Mrs. Field's ice cream sandwiches from Breyers, but wait, there's more! That knocked over box in the middle there is the NEW Peanut Butter Chocolate ice cream sandwich. $3.99 will get you a box of 4 of any of these 3 treats. In this amazingly awful shot (the first one I took actually), we see NEW Breyers Smooth & Dreamy Ice Cream bars. $4.49 gets you six chocolate coated bars of "Vanilla Caramel Chip", (Chocolate Chocolate Something), and "Chocolate Covered? Strawberry?" Sorry, I saw so many products that I took pictures so I wouldn't have to remember their names. The big yellow box on the box lists total calories and grams of fat. Now right above the Breyers bars are the NEW Breyers Smooth & Dreamy Ice Cream Sandwiches. That's right, I'm thinking the Breyers name moved away from the old sandwiches to make way for these brandy new ones. The three flavors are Vanilla Fudge Brownie, Chocolate Caramel Brownie, and Chocolate Chip Cookie Dough. Can you guess which one came back to the office with me? We aren't even close to being done yet fellow ice cream fans. Looks like individual servings is the way to go this summer. 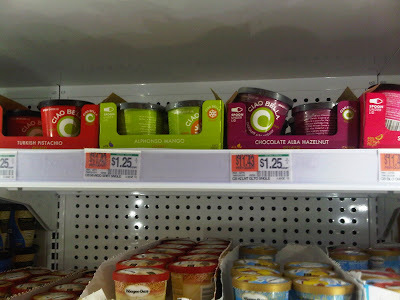 Up top, at a $1.25 for a 4 fluid oz serving, are NEW single servings from Ciao Bella (that price includes a spoon under the lid). From left to right we have Turkish Pistachio Gelato, Alphonso Mango Sorbet, Chocolate Alba Hazelnut, and ... Sicilian Blood Orange Sorbetto (got cut off). These little buggers look very similar to the ones handed out by the Ciao Bella van on the CB blog. 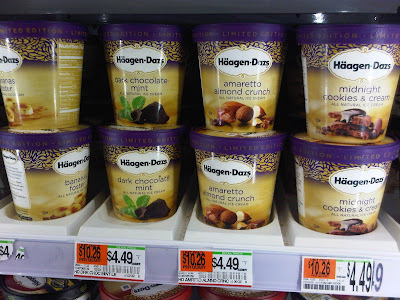 On the shelf below CB are some new Haagen Dazs singles, including their foray into single serve sorbets. I'm extremely pleased to see that single servings are branching out to all styles of frozen treat. Wait, what's this? Skinny Cow has jumped into the foray! Whoa, I didn't see that one coming --- Not only has skinny cow jumped into low fat ice cream, but they know right where to attack the dieting snacker. It's brilliant marketing actually. 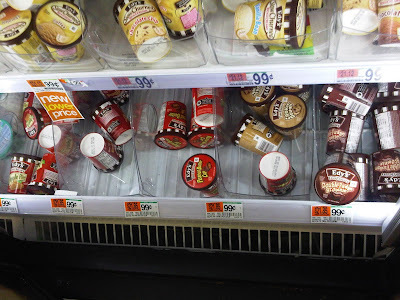 There's a whole section devoted to single serve ice creams but you're choices tend to be hit fat like Haagen Dazs and Ben & Jerrys (yes, Edy's has their low fat stuff, but we'll ignore that for now). A dieter can wander over, drool over the good stuff, then snag one of these and hopefully leave satisfied. Smart move Skinny Cow (let's hope their ice cream isn't awful). The four new flavors from left to right are Cookie N' Cream, Caramel Cone, Strawberry Cheesecake and Dulce de Leche. These containers are the most expensive at $1.50, but notice the containers are a bit bigger (5.8 fluid ounces to be precise). 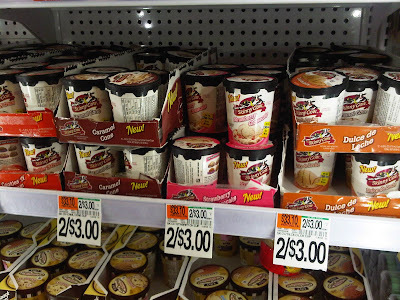 At the very bottom of this freezer section are some flavors from Edy's. You see the slow churned flavors at the top of the picture, but underneath are 5 new fun flavors they have brought to the single serve market - Apple Pie, Fudge Mocha Chip, Peanut Butter Cup, Cookie Dough and Double Fudge Brownie. 99 cents is all it takes to get you 5.8 fluid ounces of frozen relief. Are you excited yet? Ok, two more things that pushed my excitement over the edge. 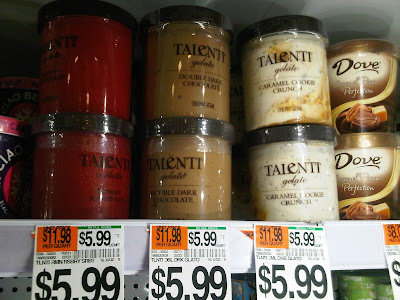 I've had the Raspberry Sorbetto before,and while $5.99 a pint is expensive, I can't wait to try the Double Dark Chocolate and Caramel Cookie Crunch Talenti Gelato. If anyone can make me a gelato fan, I'm thinking it's Talenti. Alright, last one, and this was hard to miss with the purple limited edition lids. I don't know about you, but my brain zooms right in on the Limited Edition Midnight Cookies & Cream. I don't have an exact description, but I'm guessing it's absolutely fantastic --- OK, I may be setting the bar way too high, but come on, talk about an awesome name for an ice cream, and then to make it limited edition to really drive the point home. The other flavors from left to right are bananas foster, dark chocolate mint, and amaretto almond crunch. More info: Looks like Midnight Cookies & Cream was an H-D flavor back in the late 90s, not sure if it's been around since then. The exact description is "smooth, chocolate ice cream seduced by buttery fudge and chocolate cookie wafers make for a perfect midnight, or anytime treat". Bananas Foster is "rich, fresh roasted banana ice cream blended with a brown sugar and rum swirl with notes of cinnamon and nutmeg that puts the classic dessert to shame." Dark Chocolate Mint is "creamy, fresh mint meets rich, dark chocolate ice cream in this sophisticated take on an old classic." Amaretto Almond Crunch is "crispy almond brittle enveloped in smooth amaretto ice cream creates a rich and crunchy sensation." Are you hungry yet??? Personal Note: BIG KUDOS to Haagen-Dazs for actually listing the new flavors on their website. Nothing drives me crazier than hearing about a new product and not being able to find it on a company's website. Ok, that wraps up my latest trip to the grocery store. I hope this is only the beginning of another summer filled with awesome treats. Wait, one more thing --- I know that not all of these products may not be new to you, but they are to me, so I couldn't wait to share them with everyone. That Telenti looks scrumdelicious! I wonder where in Maryland they sell it? I've had the caramel cookie Talenti gelato before, and it's AWESOME. I only bought it one time, because its expensive, but it is very, very good. I had midnight cookies and cream at the Haagen Dazs store at my local mall. Once again, it's AWESOME. I'll definitely be buying a pint or ten. I'm loving those single serving mini ice cream containers! I'm glad more brands are jumping on to the idea. And I'll definitely have to check out that HG Dark Chocolate Mint icecream....sounds great. I have not had a bad flavor of The Skinny Cow single serve yet! I can't believe how good these taste!! I was shocked afterward to see it was low calorie. I'm in trouble when these start being sold in large containers instead of just single serve!! I did go look closer, and while it is still technically LIGHT ice cream, it is now OREO light ice cream like you said. I'll have to pick some up, hopefully they arent as dry as the old ones.